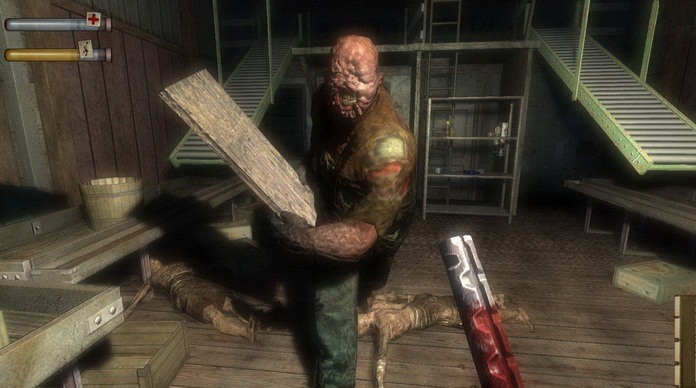 Condemned Criminal Origins premiers as a console exclusive on the Xbox 360 – it later came to PC – in late 2005 (launch window), but represents a striking change for video games. Sure, titles like Grand Theft Auto III and Manhunt were garnering attention for brutality, but those were still third person perspective titles that lacked true realism for the average player. On the other hand Condemned is first person, the weapons are almost solely melee, the audio is in surround sound, and the vibration in the controller combined by the jarring view on screen when you get hit makes the whole experience realistic. While violence-hating senators and parental groups hardly took notice, looking back it’s a visceral simulation of the brutality of those darker recesses of society we pretend doesn’t exist. Looking back on Condemned today I totally get why people don’t take it seriously, especially nowadays. The graphics are indicative of the early HD era titles with high polygon counts; round heads, shiny skin, and hilarious facial expressions are consistent. Oddly enough, that’s only in the cutscenes or if you view the game in a frozen still capture, because when this title gets in motion everything feels quite real quite fast. I don’t know why it didn’t catch on much back when it released, or why it’s still a title few played these days, but I will go on record that this is one impressive action-horror title. Condemned will jar you, scare you, challenge you, and definitely make you afraid of what’s lurking in the dark. I know many like to ask if it’s a horror game. Sure, if you need to usher it into a genre, it has enough jump scares, violence, and monsters to earn that title. 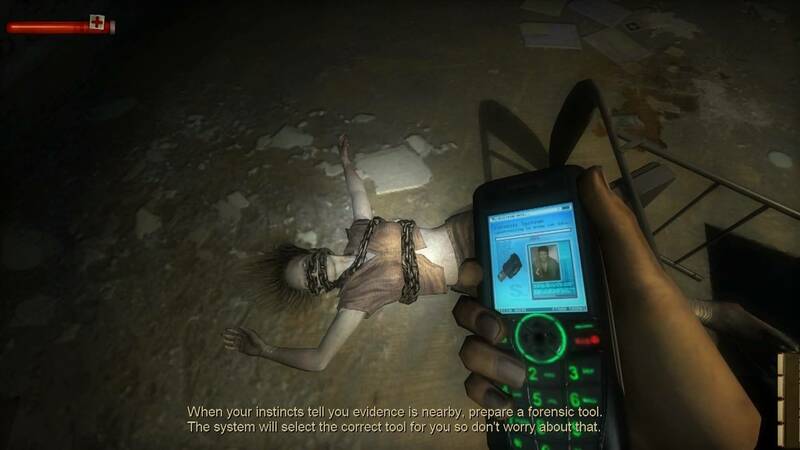 On the other hand most will probably imagine survival horror and get immediately turned off. You don’t have to worry about your weapons breaking, since there are almost no guns you don’t have to care about ammo reserves, and I would say the game is more interested in keeping you on edge with tension rather than truly scaring you. The gritty noir tale of a lawman framed and hunting down a killer of serial killers blends so many stories and popular movies from the time period to not be able to name one. As you descend into darkness protagonist Ethan Thomas doesn’t become a person you don’t want to be, but rather a person you hold more compassion for every step of the way despite his growing body count of homeless drug addicts. Once you strip away the meager (albeit interesting) plot, streamlined “detective” work, and odd phenomenon that occur in the late game, Condemned is a brutally realistic first-person brawler. That concept alone intrigues me and the accompanying gameplay that makes up almost the entirety of the game is enough for me to recommend it. This title is much more Splatterhouse than Silent Hill. Where Condmned staggers is when it tries to divert from the main path. 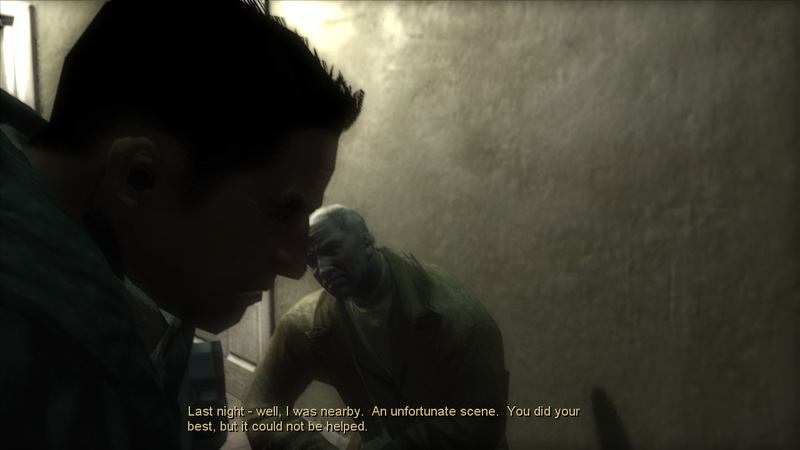 The detective scenarios are somewhat interesting, but they break the realism and danger of this type of game. Now you may be analyzing something when a guy comes out of nowhere to attack you, but it’s an annoyance and rarity rather than a game mechanic or scare tactic. There’s something supernatural happening in the game, but it’s never explained. You face it head on, sure, but at the end of the campaign it’s dismissed almost as if it was never there in the first place. I have no proof yet to back this up, but I’m betting there were two different concepts here, and as the game’s due date got closer Monolith had to find a way to blend the concepts rather than sticking with one. You also get absolutely no sense of closure and don’t get to view the consequences of the events of the game, but merely have it all explained in a brief and rote cutscene just before the credits. This lack of focus doesn’t break the game in any way, but I do think it leaves a bad taste in the mouths of most players. The final level has no true connection to the story, changes a lot of mechanics, and therefore I think many tend to reject it. I focus a bit too much on the design behind a game when playing it, but all the disconnected late game invokes in me is curiosity on what the hell may have been the supernatural explanation to Ethan’s situation. Despite my liking it, I do feel that the new mechanics and confusing plot divergence does make it a weaker story as a whole and perhaps the game would benefit chapter nine being the end. Wrap it all up and Condemned Criminal Origins is still one of the scariest games I’ve ever played if for no other reason than it keeps me tense and jumpy the entire time. Perhaps some players don’t like that feeling but personally I relish in it and have been fascinated by things that scare me since I was a child. If that experience mixed with the rush you get after a battle of wits with an enemy AI sounds tempting to you, stop reading right now and get this title today. Those that don’t like horror or couldn’t even get through Bioshock due to the slowed pacing and awkward storytelling will definitely struggle to finish or appreciate what this game has to offer. It was a great first showing for the Xbox 360 and I’m pleased to see that the even stronger PC port is not only still available but runs easy in Windows 7 (or any other later OS compatibility mode) without so much as a patch. 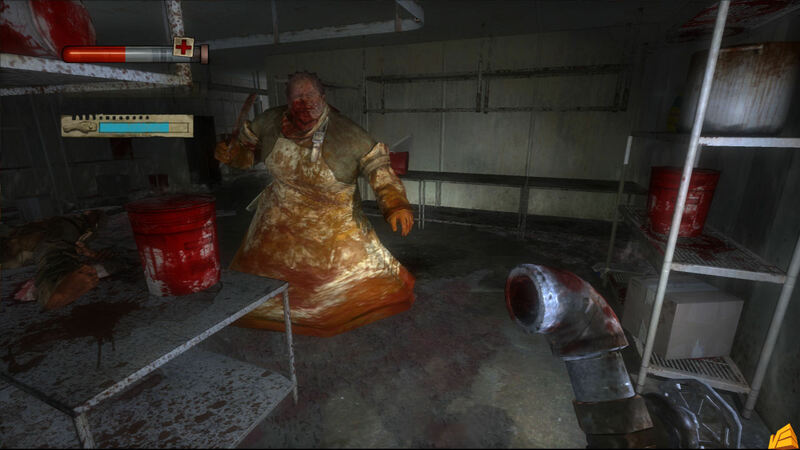 There wasn’t any game quite like Condemned when it came out and besides the so-so sequel that didn’t capture this title’s magic, there really hasn’t been once since. You know, the Xbox One and PS4 could really learn a lot from the launch of the Xbox 360. This console brought games that harnessed the power of the new hardware and very much made hungry gamers happy to push their previous consoles to one side and embrace the new. 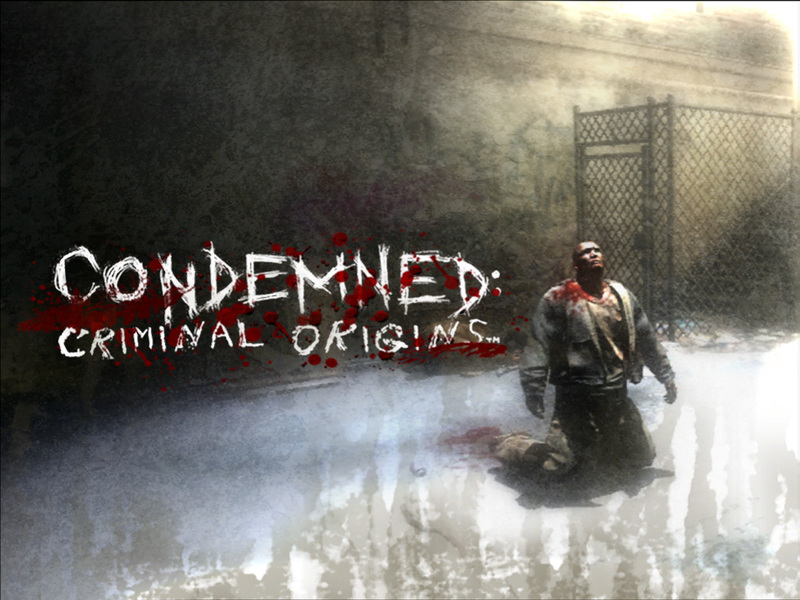 We had great tiles like Kameo and Perfect Dark Zero (shut up haters, it’s good), then there was this little horror game published by Sega that lingered in the shadows called Condemned: Criminal Origins. Developed by Monolith, Condemned was the type of horror game I could not wait to try, I loved playing this game back in the day and was actually one of the first games I reached for when I jumped to next gen. After replaying the game for this months spooky game club its time to share my thoughts on how Condemned holds up now. Condemned clearly takes inspiration from the film Se7en in its design, a film by David Fincher, which I think is just fantastic. So when I started the game and was greeted with similar opening credits scene to the film I knew I was about to play something special. You are put in the body of Ethan Hunt, and I mean literally put in the body here. The game plays out in the first person perceptive properly. You can see your legs when you look down and when Ethan is ducking under yellow Police tape you will be following this animation all from his eyes. Games in the first person perspective are common place to this day but few actually have body awareness, I still find it barmy how you look down in most FPS games only to discover you’re a floating torso. Ethan is a forensic expert, the game will literally grind to a halt at times and get you to investigate crimes scenes and pull out tools and your camera to move the plot along. Some might find this tedious but it really adds to the immersion of the scenario. Ethan soon finds himself at the wrong end of serial killer chase and ends up being accused for the murder of two fellow police officers. So Ethan ends up on the run and on the hunt for the real murderer. The story really starts off on quite a strong note as you question Ethans mental stability. After all Ethan does seem to have a rather odd obsession with looking for serial killers in abandoned buildings infested with deranged homeless people. The plot feels like it’s building to something, but in the end I just felt the pay off was not as good as it could have been. It’s not to say the story is bad, it just fell at the last chapter, the developers lost the plot and just needed to drag the story out for an additional chapter for the sake of it. Despite the pay off the journey to the end was satisfying. From the first level Condemned makes it very clear that your going to have to start getting good at melee combat. This can feel very difficult at first as you need to find the right timing and balance between attacking and blocking with various melee weapons littered around the level. What I like about the weapons designs is that they are everyday items that probably would be just lying around like poles, draws or planks of wood. You will pretty much be fighting crazy homeless folk through the entire game all of which look horrific in design. These are not locations you would want to visit in real life. The AI is impressive for the combat the enemies will try to trick you with surprise melee swings but once you have mastered the pattern you’ll find your set for the rest of the game. Its also quite refreshing that the crazy homeless people won’t just attack you, they will literally beat each other up which can play as a tactic in itself when playing. The game will throw the odd gun at you but your ammo is very limited. Every shot really does count in this game as you can not refill ammo on any weapon, once its gone the best you can do it whack the enemy with the back end of the gun. 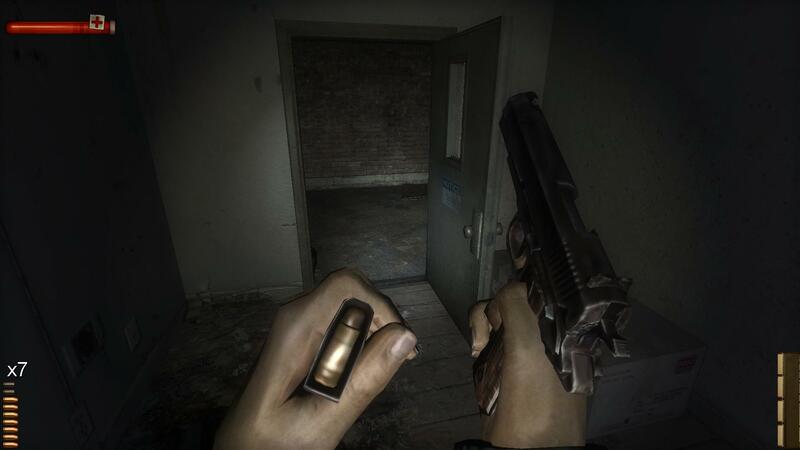 One of the best moments when holding a gun is the ability to check you ammo, doing this will lead to a small animation of Ethan pulling the clip from the gun and giving you the ammo count in the corner of the screen. This is another fantastic tool of immersion that I have never seen in a game since. 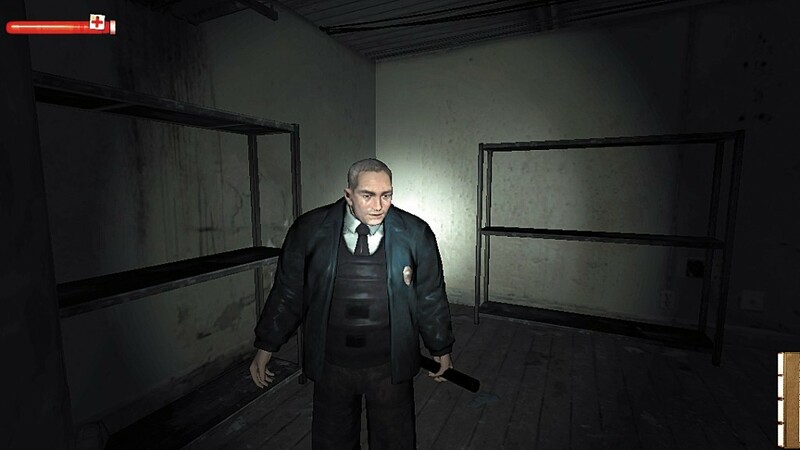 The big question for some will be “is this game scary?” Condemned creates a very dark and very grim atmosphere. You’re walking along in dark environments throughout this game, its very creepy and I became anxious for what could be around the next corner. The game does have a fair few jump scare moments but they never feel over done. Some of the greatest scare moments in this game are the ones you really don’t expect my favourite by far is the infamous scene with mannequins. 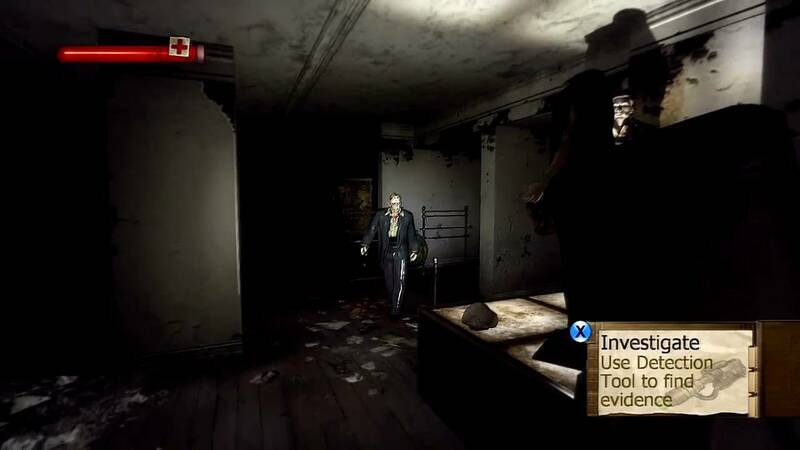 Condemned is split up into ten levels all of which vary in length. It was quite surprising to play through one level which took around twenty five minutes only to follow it up with a level that took less than five. A massive feature that really helps Condemned is the ability to save anywhere. Good lord is this a feature I wish was in every game. Being able save anywhere allows you to take your time through the game and of course reload sections you think you could improve on. Maybe that homeless fight could have gone better. Checkpoints are also featured but its nice to be given a choice. 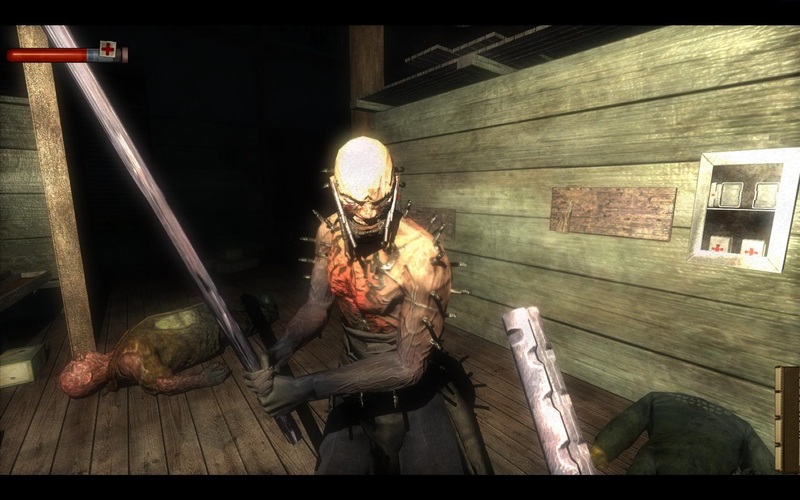 Overall, Condemned is an absolute must play for fans of the horror genre and game design in general. The game may be a linear experience but its an enjoyable journey even if I felt the pay off at the end was disappointing. Replaying Condemned was actually a very enjoyable experience even though I’d played through it before. The games not perfect, the gameplay at times can feel clunky and unfair but that didn’t stop me once again enjoying the experience. However, there’s definitely no way I’m going into a dark room with mannequins now. 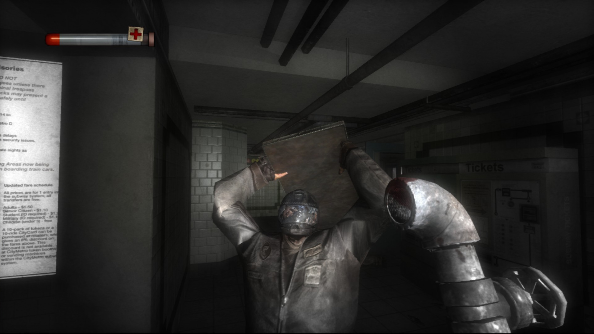 Want to learn more about Condemned or see it in action? Check out our profile page that includes a podcast and full gameplay video.